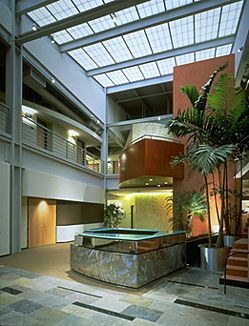 Cosimo Pizzulli’s interior and lighting design for the West Coast headquarters of Sony Music in Santa Monica eliminates overhead lighting. it relies instead on sylights, task lights, and furniture-mounted indirect sources that glow off sound-absorbent architectural elements at workstations that can be adjusted by individual workers. Accents include recessed neons, incandescents in soffits, compact quad fluorescents in sconces, and the ever-changing results of the staff making itself comfortable by switching the ambients on and off.